Back to the 80s: H is for Hunters & Collectors. Back in the early 90s, my husband and I saw them live at the State Theatre in Sydney. It was a good concert, and we both found it amusing to watch the teeny-boppers at the front of the stage, particularly when the band began playing some of their earlier stuff. There was a highlight that we have not forgotten. Standing next to us was Australian television personality Andrew Denton, who my husband began talking to. When the band began playing their iconic song ‘The Slab’, or ‘Betty’s Worry’, the teeny-boppers looked bemused and sat down, however my husband and Andrew Denton got right into it and yelled the lyrics into each others faces. Priceless! 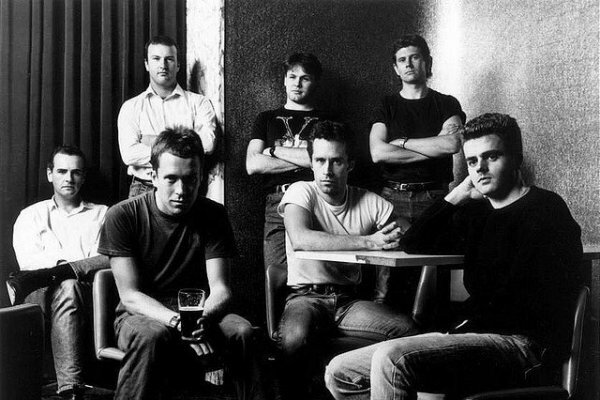 Hunters & Collectors were formed in Melbourne in 1981. They released two albums in the early 1980s, neither one reaching the Top 50 in Australia and the band briefly disbanded. They soon reformed and released another album, Human Frailty in 1986, which became their first Top 10 album. The song ‘Throw Your Arms Around Me’, would eventually become one of their most popular songs. They went on to release another half a dozen albums, were nominated in six categories at the ARIA Music Awards in 1990, and supported Midnight Oil’s tour of the U.S. during the same year. Internal tensions grew within the band a few years later and they would eventually disband in 1998, undertaking their final Australian tours in the same year. In 2005, Hunters & Collectors were inducted into the ARIA Hall of Fame. Other bands formed or who had hits in the 1980s starting with the letter H include:- Huey Lewis and the News, (The) Human League, Hoodoo Gurus, Haircut 100. What other bands of the 1980s that begin with the letter H can you think of? What bands do you like that make you a ‘little different’ to your friends? Do you have some memorable moments at concerts you’ve been to? Previous Post Dealing with Writer’s Doubt. Next Post Using Cemeteries for Writing Inspiration.